Kar and I have a thing for “pop-tarts”. I would always sneak them in the grocery cart when I was little. When I was thumbing through the April issue of Bon Appetit I saw a recipe for homemade pop-tarts and I let out a squeal of delight! Genius. With wedding season upon us, I think these would make for a really great, unexpected shower treat. They are flaky, buttery deliciousness. Whisk together flour, salt, and sugar in a medium bowl. Add butter. 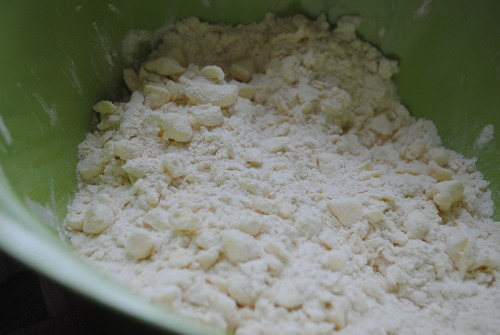 With a pastry blender or back of a fork blend in butter until mixture resembles a course meal (see picture below). Add ice water by tablespoonfuls, tossing until moist clumps form. You don’t want to add too much water as it will result in a tougher crust. The dough will be somewhat dry and flaky. Gather dough into 2 equal size balls. Shape balls into disks. Wrap each disk in plastic wrap. Chill for at least 1 hour. Line 2 large rimmed baking sheets (jelly roll pans) with parchment paper. Take one of the dough disks and roll it out on a floured surface or a ROLL’PAT (ROLL’PAT’s have changed my life). To about 13x11. Trim it to be one big even rectangle (about 12x10). 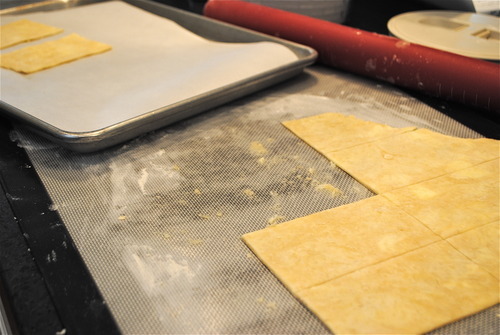 Cut your dough rectangle into eight smaller 5x3 inch rectangles (I like to use a pizza cutter). I just eye-balled mine instead of getting too tick-tacky with the measurements. You’ll be better at it than you think. Arrange 4 rectangles, spaced apart, on one of the cookie sheets. Spoon 1 1/2 tablespoons preserves on each dough rectangle. Spread the preserves down the length of the rectangle. 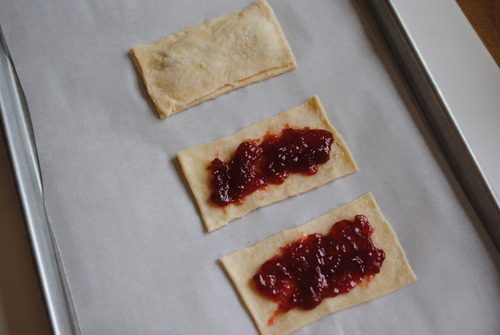 Top preserves with second dough rectangle. Press down all edges of each tart to seal. Take a fork and press all edges with tines of fork to double seal. Poke a few holes in the top of each tart. Follow these same steps for the 2nd dough disk and baking sheet. Bake at 375 degrees for 15 minutes then turn baking sheet and bake for another 10-15 minutes (some preserves may leak out and that’s A-ok). Immediately transfer tarts to a cooling rack. The Bon Appetit recipe calls for dusting the tarts with powdered sugar, but that wouldn’t be a REAL pop-tart now, would it? Mix together all ingredients in a small bowl with a fork until you have a nice runny-honey consistency. 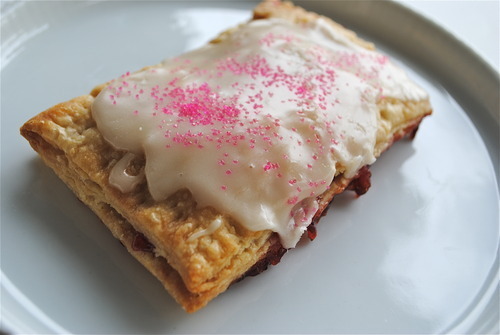 With the fork drizzle icing over warm pop-tarts. Smooth it around to cover the top of each tart. Sprinkle with some crystalized sugar to seal the deal. Serve warm or at room temperature.